Hand carved from Basswood. 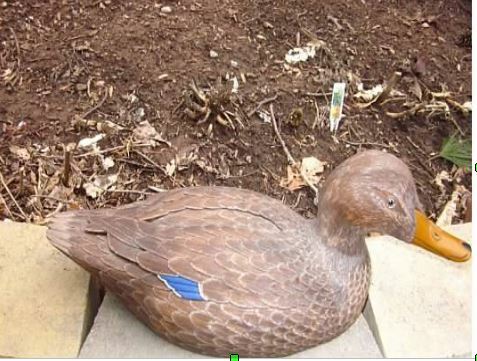 Individual feathers are etched, the decoy is stained, glass eyes are implanted, it is painted in acrylics and sealed. $80 plus $20 shipping and tracking. steel grey head with white crescent patches . Hand carved from Basswood. Individual feathers are etched, the decoy is stained, the glass eyes are implanted, it is painted in acrylics and sealed. 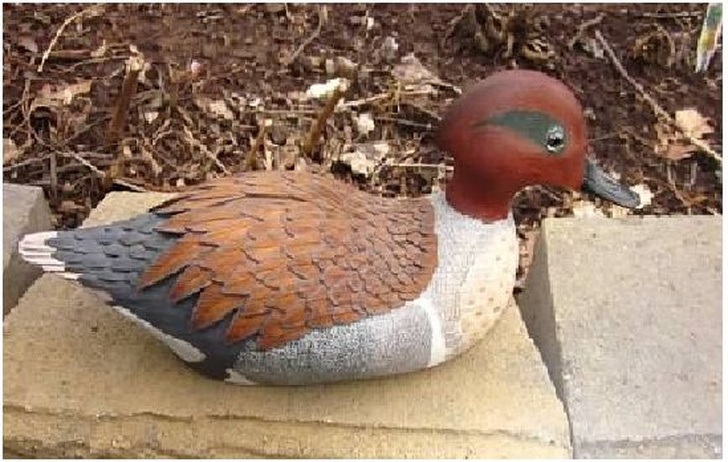 Full sized Canvasback Drake (11"x 5-1/2"x 5-1/2"). 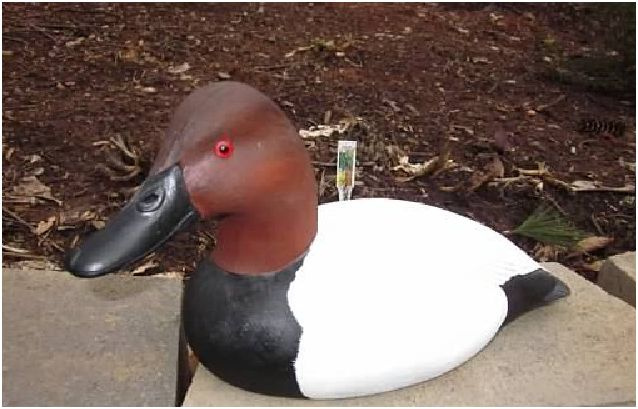 Fastest flyer of all North American ducks, the Canvasback population has diminished in recent years. Hand carved from Basswood. Individual feathers are etched, the decoy is stained, the glass eyes are inserted, it is painted with acrylics and sealed. 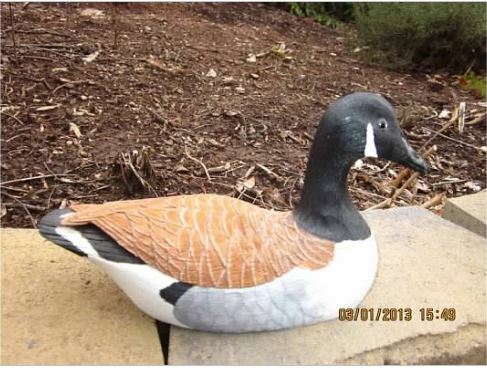 decoy has not been feather carved or etched. It is painted decoratively with acrylics and sealed. black stocking head and neck and white cheek patch.Hand carved from Basswood. Individual feathers are etched, the glass eyes inserted, the decoy is stained, it is painted in acrylics and sealed. $90 plus $20 shipping and tracking. 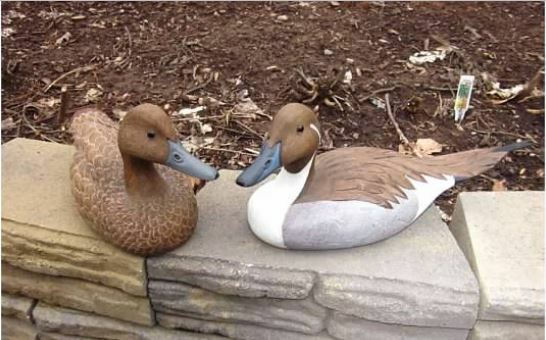 Pair, Pintail Ducks (11”x 4-1/2”x 5”)Because of its trim appearance and swift flight, the Pintail is often referred to as the “Greyhound of the air”. It is the second most abundant duck species in North America. Both hand carved in Basswood. 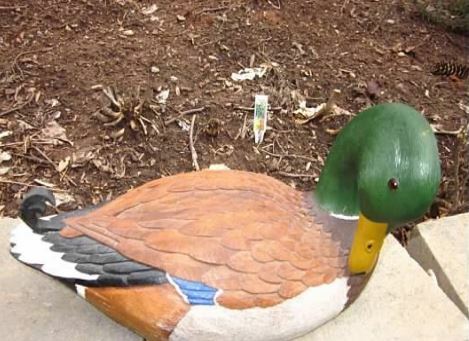 Individual feathers are cut and etched, the decoys are stained, the glass eyes inserted, they are painted in acrylics and sealed; the Drake has wooden tail feather inserted. 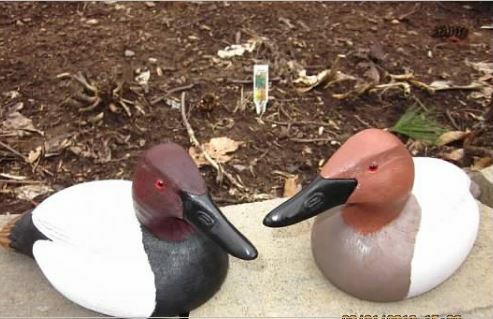 Pair, Small Canvasback Ducks (8-1/2”x 4-1/2”x 4-1/2”)Large, fast-flying ducks whose numbers have diminished greatly in recent years.Both ducks carved from Basswood. Feathers are individually carved and etched, the decoys are stained, the glass eyes implanted, then they are painted in acrylics and sealed. $125 plus $20 if purchased as a pair; $75 plus $15 shipping and handling if purchased separately. 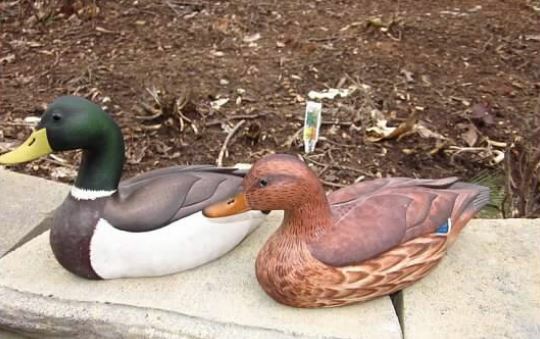 Pair, Small Mallards (7”x3-1/4”x 3-1/4”).Most abundant duck specie in the worldHand carved from Tupelo wood. 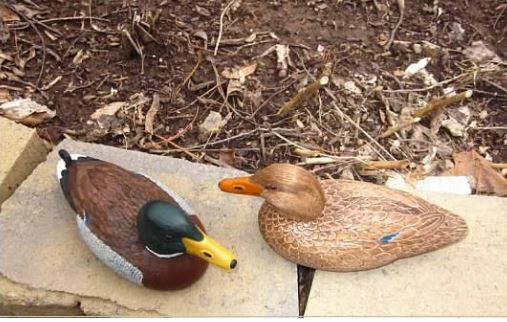 Both ducks have their individual feathers etched, the decoys are stained, the glass eyes implanted, are painted in acrylics and sealed. The Drake has a wooden curl feather implanted. $125 if purchased as a pair plus $20 shipping and tracking; $75 each plus $15 shipping and tracking, if purchased separately. 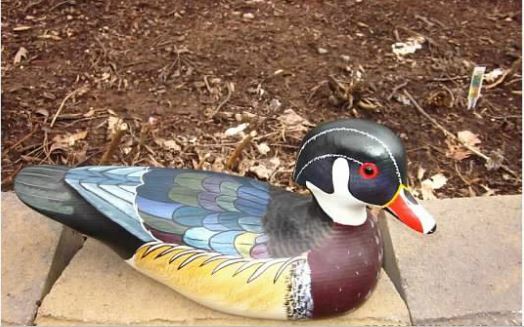 Pair, Wood Ducks (10-1/2”x 4”x 5-1/4”)The Drake Wood Duck is one of the most colorful waterfowl creatures in the world. Near extinction in the 1900’s, conservation has restored the species greatly. 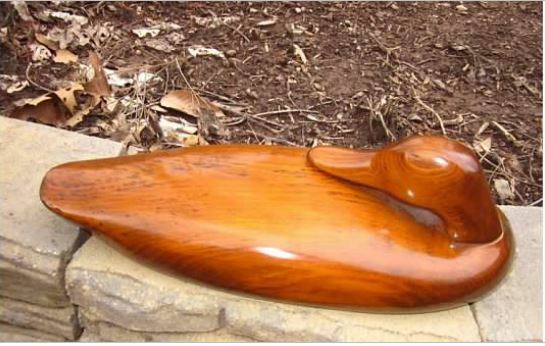 Hand Carved in Basswood. Feathers are individually carved and etched, the decoys are stained, the glass eyes implanted, then they are painted in acrylics and sealed. $125 plus $30 shipping andtracking if purchased as a pair; $75 plus $20 if purchased separately. body finished without detail, stained and varnished. $100 plus $20 shipping and tracking. Small Canada Goose (9”x 3-1/4”x 3”)Recognized by its clear resonant honking call, black stockinged head and neck and white cheek patch.Hand carved in Basswood. 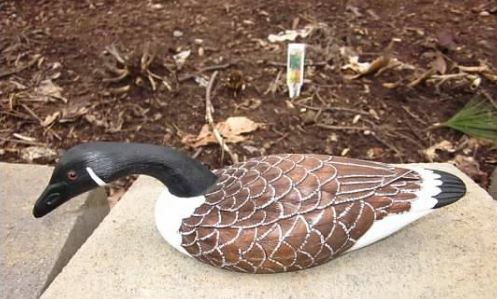 Stretched neck goose, feathers individually shaped and etched, the decoy is stained, the glass eyes are implanted, it is painted in acrylics and sealed. 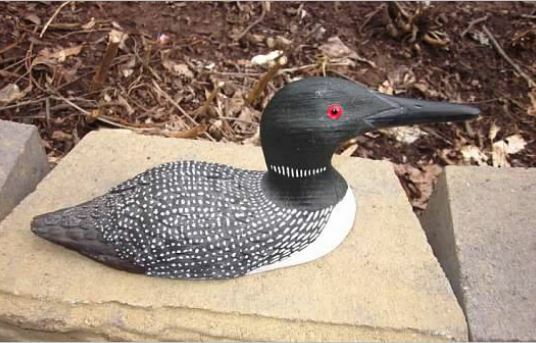 Small Common Loon (9”x 3-1/4”x 4-1/2”)Found principally in the North, the Loon has a piercing cry. are inserted, it is painted with acrylics and coated. $75 plus $15 shipping and tracking. 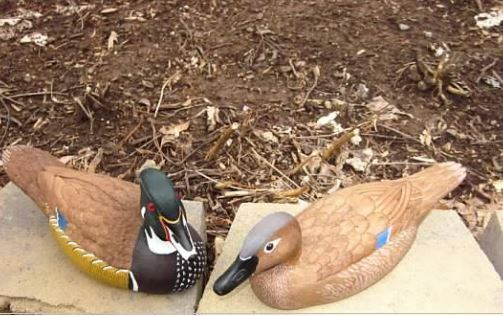 Small Mallard Pair (7-1/2”x 3”x5”).Hand carved from Tupelo wood, painted and coated; created by Jerry Funderberg. $75 each plus $15 shipping and tracking if purchased separately, $125 if purchased as a pair plus $20 shipping and tracking. 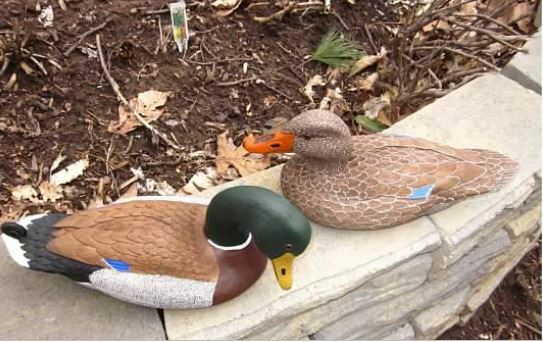 Pair, 3/4 Sized Mallards, Preening Drake and Straight Hen (10”x 4-1/2”x 4-1/2”).The world’s most abundant duck. The Drake is probably second only in colorful appearance to the Drake Wood Duck. implanted, then they are painted in acrylics and sealed. The Drake has a wooden curl feather implanted. For any questions or comments fill out form below.